Liquid crystal displays (LCDs) are flat, thin electronic displays. You can find them in watches, cameras, cell phones, tablets, TVs and many other electric and electronic gadgets. 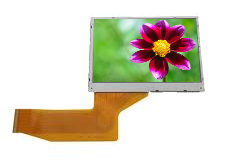 LCDs are lighter and require significantly less power than older display technologies. They are so widely used that there is a good chance you are reading this article on an LCD screen. The LCD, similar to an image sensor, has a two-dimensional grid of pixels. Instead of measuring light, however, each pixel in the LCD emits light. Since the brightness of each pixel can be controlled independently, the display can be used to show an image. The working principle of an LCD is based on a fascinating property of light called polarization and a special type of material called liquid crystal that can control the polarization of light. Keep reading to learn about these and how they come together to bring an LCD to life.